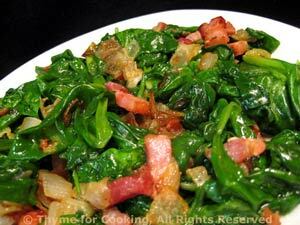 Wilted Spinach with Bacon and Onion, Thyme for Cooking easy sides. One of my favorite ways to eat fresh spinach: tossed with bacon and onion and a dash of vinegar. Be careful not to cook the spinach too long; it quickly goes from just wilting to fully cooked and limp. You want it to still look like spinach leaves! Wash and stem spinach if needed. Drain in a colander. If you don't feel you need to wash it - do it anyway. We want a little bit of water on the leaves - what ever is left after draining well - and shake them around a bit, too. Sauté bacon in medium nonstick skillet over medium heat until crisp. Remove and crumble. Add onion and sauté until tender and starting to brown, 7 - 10 minutes. Add spinach and stir fry for 1 - 2 minutes, just until spinach starts to wilt. Add crumbled bacon, sprinkle with vinegar and serve.